JP Morgan Chase Credit Card Hurts Consumers but Looks Good to Wall Street Investors. What's Good for Wall Street is not necessarily Good for US. (Edit Note). This topic got me so angry that I have started a protest website against Chase Bank and anybody else who follows them down their racketeering path. Chase Credit Card already was lambasted by its customers for wanting to charge a 10 dollar a month "user fee". The 10 dollar monthly fee would have instantly made Chase a violator of their low interest fixed rate lifetime balance transfer offer, but Chase tried it anyways and had to be rebuffed by the New York Attorneys General office and Chase customers before removing the monthly fee. In an effort to impress Wall Street by increasing their revenue, JP Morgan / Chase Credit Card has now decided that a customer's right to "opt out" to new changes in Chase's Credit Card terms no longer exists. Chase Credit Card has opted out of allowing its customers to opt out of new Credit Card Rules that forces the consumer to increase their monthly minimum payment by 250 percent! I believe Chase Credit card will probably have improved financial results next quarter because of their boorish tactics, and that Wall Street and the News channels will report Chase's "success" as "good news". The news statios will then conclude that the economy is recovering. What won't be reported is the misery the change in terms Chase has wrought upon good, honest people who were diligently paying down their debts and were not allowed to "opt out" when Chase raised their monthly minimum charge by 250 percent. Hundreds of thousands of Chase Credit Card Customers accepted Chase's offer of low, fixed interest credit card rate balance transfer offers with rates that would never go up on the amount transfered if the customer was never late on their monthly payment. These customers have now been forced to accept a jump in their monthly minimum payment from 2% to 5%, or, they can keep the 2% monthly minimum payment but have their interest rate increased from 5.99% to 7.99%. Ironically, I created a website a few years ago that demanded credit card companies raise their minimum monthly billing by a factor of 3 or 4 (aka 6% or 8%) called credit-card-cap.com. However, my idea was to raise the monthly minimum payment on new debt by beginning borrowers, NOT OLD DEBT in which such tactics can just burst a families tender economic bubble. The changes Chase is making would be fine, as long as the customer had the right to "opt out" of these new changes. "opt out"means the customer is in essence closing out their account at the terms that were in play when the customer agreed to the original credit card balance transfer loan. When "opting out", the customer further agrees to continue to pay off the debt while no longer using the credit card. "opt out" is a fair and righteous protection that should be automatically granted to all consumers when dealing with credit card companies, yet the "opt out" option has never been given teeth by those who claim to protect us. Our government, our consumer rights advocates, our president, and our congress people don't seem to think that you, the consumer, have a right to "opt out" and stick to the original credit card agreement that you signed up for. A deal is only a deal as long as the credit card companies can change it later on, without any recourse from you but to IMMEDIATELY pay off the ENTIRE debt or accept new terms which most often favor the credit card company and hurt the consumer. Until credit card customers have the undeniable right to "opt out" from any sudden or new changes regarding the terms of their existing credit card agreement before the changes are made, the consumer will continue to get royally railroaded even as Wall Street and the financial news programs cheer the increase in revenue these leveraged consumer bashing manuevers will probably bring to the credit-card-companies. Maybe the day is coming when ACORN will demand Barack Obama actually be for the consumer. Surely what Chase Credit Card just did is a strong start towards getting ACORN hopping mad, especially if Barack Obama does not intercede and demand that consumers have the right to "opt out" of changes made to their prior credit card agreement. Domestic Abuse is out of Control. Nicole Word is Attacked in Court by Ex-boyfriend during her testimony. Judge Stops Attack, Media Idolizes Judge. 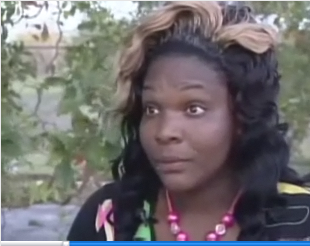 Latreasa Davis had the guts to demand her actual money back from a McDonalds that was planning on giving her a substitute meal she did not want. Davis was ridiculed by the media for calling 911 when in reality she was a heroic consumer advocate who wouldn't sit at the back of the bus after McDonald's refused to refund her money for a meal they could not produce. Davis's reward was to be charged with a crime for calling 911 while the media laughed at her. This weeks female media victim is Nicole Word. Nicole Word, the Poster Woman for Repeat Domestic Abuse who so far had survived numerous alleged stalking attacks by her ex boyfriend, has now been dropped from her own story so the media could glorify the judge "who saved her". Not only did Nicole Word have to survive repeated alleged threats against her life from her estranged "boyfriend", but just as she was testifying against him, IN COURT, he attacked her AGAIN! Click Above to see the RARE news story version in which Nicole Word is actually featured in the story along with the heroic judge. Or click here to see the article and the video. Sadly, the only reason this story even made the headlines was because of the video inside the courtroom. There would have never even been a story about the repeated domestic abuse attempts if the abuser hadn't then done it in court! 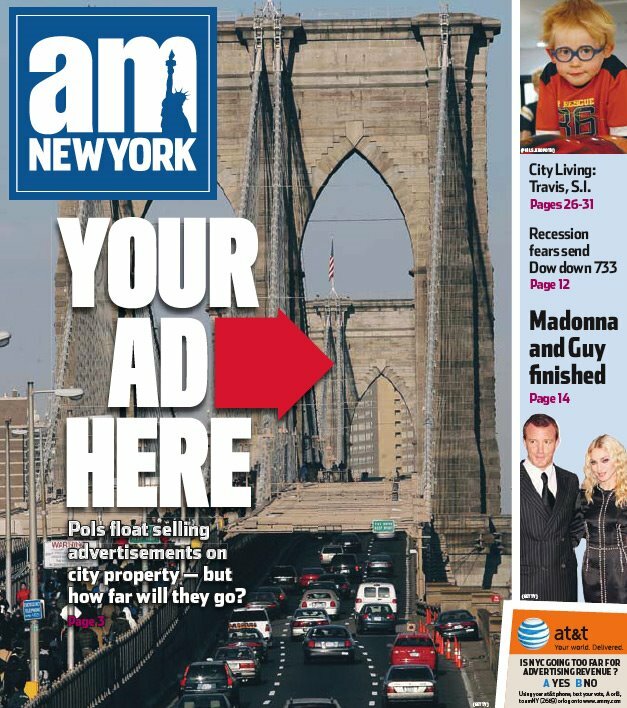 So you would think that Nicole Word would be featured front and center. Nope. Instead, the story makes news across the county because of the "heroic" actions of the Broward County Judge, Ian Richards. My question is, who is the real hero in this situation? Is Judge Ian Richards the hero for stopping an assault in his own courtroom, or is it Nicole Word, who fended off several alleged death threats and had to face her tormetor in court and then survive a beating by him in court? According to the media, the judge is the hero, and Nicole is just a footnote. I base this conclusion on the following. I did several google searches. It was not until I put Nicole Word's actual name in that was I able to find a video that showed her being interviewed. In all other cases, the videos were all about The judges heroics in jumping over his own bench to save the female in distress from an attacker. GASP. KCAL in Los Angeles ran the original video seen above, but has not archived this story in their own internet video library so after it ran on the air, it basically disappeared forever. To glorify the judge without knowing about or hearing from the victim is just wrong. If you didn't already know the name of the female victim, odds are you wouldn't find the very scant coverage that included her own words about what happened. The media has gotten adept at being wrong when it comes to how they view Women who are champions. Addicting Kids to the Internet one Gogurt at a Time, Soupy Sales would be proud. I like Gogurt yoplait yogurt because somebody I know who is very ill likes eating it. However, I don't like what I read on the individual packets that contain Gogurt yoplait yogurt . There is a code number printed on each gogurt packet that entices the enticable to... Enter this code every hour for a chance to win! You could win a A Flip Ultra Camcorder. Enter at gogurt.com to see if you are a winner. There are 32 yogurt packets in each box of gogurt and one could literally spend a good portion of each hour entering each of the 32 code numbers. I find this type of marketing to our youth unacceptable. Addicting kids to entering the same 32 code numbers "hour after hour" for a chance to win is manipulative. Not only does it get the kids hopes up, but it also probably gets the hit counting up for gogurt.com while addicting these kids to keep trying to win a prize. This is just wrong. Yoplait, I love your gogurt product, but I hate the way you are getting kids to post to your site each and every hour. Back on New Years Day, 1965, Soupy Sales encouraged his viewing audience comprised of youngsters to go into mom's purse and Dads wallet and pull out the green stuff with pictures of men with beards on them, and mail them in. 80,000 thousand dollars, and one well deserved one week suspension, soon followed. F Bombs and swear words may reduce how many googlers see your blog when they do a google search. I recently read that if a blog uses profanity, including the f word, that the google search engine may automatically reclassify the blog as "adult". Googlers can choose the "safety" level of their searches which includes an an option to avoid adult websites and blogs. Using the f-bomb in a headline or in an article may cause the google computers to reclassify a blog as "adult". Using the f word may just result in f'ing ones self when it comes to maximizing who will see a blog when others do a google search. To PUMA Bloggers, please comment here if you think your new blog articles take longer than 30 minutes to update on Daily PUMA. Daily PUMA does not directly control when your articles update. Sometimes DailyPUMA can delete and then re add a blog and the blog will update, but it is not a sure thing that that will work. There are a few blogs that don't seem to update as quickly as other blogs. Maybe we can figure out if it is the same blog service that is having the delay by getting a tally on which blogs don't update relatively quickly. If you feel your blog is not updating quickly enough on DailyPUMA, please leave a comment along with the name of your blog and how long you think it takes for the updating to actually occur. From Hillary's Village - Forum, (03.19.09) "Former ACORN Employee: More Than Half Voter Registrations Invalid"(newsmax) Employee terminated by ACORN..
Link to Hillary's Village Topic, too bad the Republicans didn't care about what happened to Hillary Clinton during the 2008 democratic race. Not caring about what happened to Hillary Clinton basically ensured that the Republican Party waited too long to investigate ACORN. Wow, 60 Different PUMA Blogs posted new articles in the past 24 hours. This seems like some kind of record to me, 60 new articles from 60 different PUMA blogs within the past 24 hours. Impressive. Peanut Salmonella and FOOD SAFETY, FDA Apparently has very little power over the conduct and practices of food suppliers IN THE UNITED STATES. 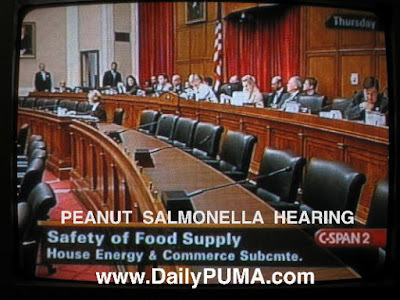 Safety of Food Supply 2nd meeting by the House Energy and Commerce Subcommittee over the Peanut Salmonella outbreak revealed several interesting things. 9 people died from salmonella that was apparently linked to the recent peanut salmonella contamination. that sent their own quality control food inspectors to PCA and found the conditions deplorable, kept their discoveries "in house" and did not share the results with anybody else. PCA was required to conduct their own investigation, hired a private company to do it, and magically received an A+ rating along with a certificate proclaiming PCA as a company in excellent standing. John Dingall, a congress person from Michigan, took a swipe at the Bush administration by stating in the last 8 years nothing was done to improve the FDA's ability to prevent what happened at PCA. I kind of wonder what the Clinton administration did in the area of food safety. I could see the issue being lost during Bill Clinton's first term in office because of the attempt at healthcare reform, two Republican led congressional shut downs over the budget, and then the Republicans contract with America. During the second term, Bill Clinton's hands were tied his final two years while Republicans witch hunted him. Prior to Bill Clinton there was 12 years of Republican rule so probably more food safety inactivity could be found. Yet here we are in 2009 and food companies that violate health and safety practices are required to pay for their own investigation. It seems like the less money they spend, the less will be found "wrong", and that is exactly what happened in this instance. Federal Judge orders Los Angeles City to Allow REALLY HUGE, OBNOXIOUS BILLBOARD ADVERTISING that Covers Entire Sides of Huge Hotels. It looks like World Wide Rush LLC and Sky Tag Inc., will get to blight the city of Los Angeles with huge billboards that hang from the side of really large buildings. 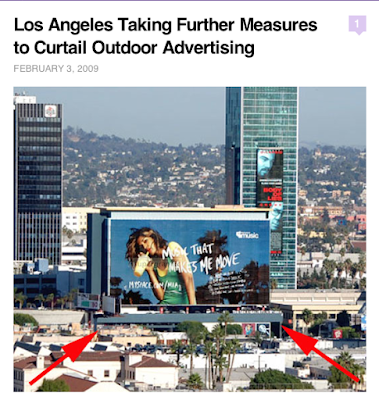 I think Judge Audrey B. Collins erred in allowing World Wide Rush to basically get their way when it comes to hanging HUGE billboards from the sides of Hotels that can be seen from Los Angeles freeways and that are visible from freeway off ramps and freeway interchanges. It is kind of freakish to think that when I am driving a car I have to actually avert my eyes from distractions that are designed to, distract me into looking. Maybe Judge Collins assumed that the huge billboards will cause the drivers to look back up at the road from their text messaging and pay attention, sort of like, two wrongs, looking into one laps while text messaging, and looking into the skyline at huge billboard ads will cancel each other out and cause the driver to actually just look at the road directly ahead. There are other issues to consider, that is for sure. A hotel that is barely making it financially might find the revenue they receive from the billboard advertising to be the difference maker in being able to pay their California state and local taxes, oh the irony of that one. If the judge is forcing the city of Los Angeles to comply to the whims of "free speech bill board entrepreneurs", can a driver who is distracted by the huge billboards and causes a severe accident then sue the city of Los Angeles as well? Can the judge make a motion to deny all such lawsuits in advance? Or at least protect the city of Los Angeles from such lawsuits? Will car insurance companies raise their rates to those who drive by these huge billboards, thereby once again making it JOE citizen the one who ultimately subsidizes these ads? Or has the judge basically said that L.A. must allow huge, distracting billboards, and then allow citizens of L.A. to sue when those signs cause an accident, while also allowing insurance companies to raise their rates in these areas. Now that is one heck of a stimulus package. Or should we call it a scrumulous package? What if the ads are for fraud driven products? Is there a psychological ploy at work in which seeing something so ostentatiously presented must mean it is either ethical or truthful? Will politicians be on these huge billboards in the not too distant future? Big Brother Consumerism towers over U.S.
Disney's Escape to Witch Mountain has controversial scene in it. Years ago, a movie came out in which drunken college kids lay out in the middle of a roadway and attempted to prove their manhood by not flinching as unsuspecting cars drove by them. Of course, in real life a few drunken college kids tried this out as well. As I recall, at least one person lost their life, and another person was badly injured. In the Disney Movie Witch Mountain, we have a much younger person standing in front of a fast moving car. The fast moving car obliterates upon impact with the young person, aka a witch. Just curious if this scene was necessary to the making of this movie, and I hope that nobody out there believes it is possible to stop a fast moving car by standing in its way. Is this the kind of stuff that should be censored since it can influence the mindset of minors in a way that can be fatal? MoveOn.org Tells a Big Lie about Ronald Reagan and his Income Tax Rate Cuts while Extolling Barack Obama's Tax Increases. I wasn't a Ronald Reagan fan. I felt Mr. Reagan really didn't respect the environment, was too pro business, and somebody in Reagen's camp was able to engineer the Iran Hostage release to coincide with his inauguration ceremony. However, Ronald Reagan did reduce come tax rates TWICE during his presidency, and he was right both times for doing it. Also, Ronald Reagan had to negotiate with many different conflicting factions to get these tax cuts approved, and that made these two income tax cuts amazing achievements. According to Moveon.org, Reagan's tax cut can't compare to Barack Obama's tax increase. Here is the madness Moveon.org has sent out to their huge mailing list. Even though I was not a Ronald Reagan fan back in the 80's, I find the above email to be one of the most misleading, fraudulent, and despicable communiques ever sent to a LARGE mailing list by a group such as MoveOn.org. When Ronald Reagan took office income tax rates for the wealthy were 70%. It was impossible for Ronald Reagan to lower it in one fell swoop to anything resembling a reasonable amount. I find it amazing that Ronald Reagan was able to cut the upper end income tax from 70% all the way down to 50% during his first term. What Moveon.org conveniently leaves out is that Ronald Reagan further reduced the maximum income tax a second time, during his second term in office, to 15, 28. & 33%. In other words, when Ronald Reagen was re-elected, he was able to pass legislation that lowered income taxes a second again. Kind of logical and ethical to wait until a second term before doing the second tax cut, no? In the meantime, the comparison of Ronald Reagan to Barack Obama by Moveon.org, when it comes to income tax rates, is a headshaker at best, and something clearly Moveon.org is incapable of doing in an honest and forthright manner. Credit Card Companies Increase Global Warming Risk Every Time they Increase Interest Rates on Old Credit Card Debt. While the media trains us to believe that Wall Street is the God of all Gods, the wall street banks that received huge amounts of bailout money from the government continue to RAISE their credit card interest rates on their customers. It is one thing to charge higher interest rates on new credit card debt, but it is evil to retroactively raise the credit card interest rate on old debt. The longer it takes a consumer to pay off an old credit card debt because banks are now increasing credit card interest rates, the more that consumer has to work to pay off their old, ever rising debt, and the less money there is available to maintain the present economy. Old credit card debt requires the consumption of even more of the earth's resources by that consumer/worker as they attempt to earn more money so they can pay down their old debt that the banks have already profited from handsomely. If this old debt could be paid down to zero, than the person has a choice, either buy new products, but at a slower rate, or just consume less and not run up new debt. Plus, if the monthly minimum payment were increased to 8 or 10% of the total due, most people would not run up as much debt as they did when the monthly minimum payment was 2% of the total due, and more of their payment would go towards principle as well. The higher monthly minimum payment would help conserve the world's resources by reducing life long indenturedness. Life long indenturedness helps cause global warming, assuming you believe global warming is occurring. Show me jobs that don't require the earth's resources and everyone could be a millionaire. Show me a person working to pay down an old debt that continues to inflate because of 15, 20 and 30% interest rates, and I'll show you why we are doomed as a planet. Yes, older credit card debt causes increased global warming risks. If you don't believe in global warming risks, the accelerated overuse of limited earth resources occurs when people work to earn money to pay off old credit card debt that the banks have already profited from. Old credit card debt continues to increase and multiply because of the obscene interest rates associated with them, sort of like the way cancer increases and multiplies. If you think cancer is good, then so is old, high interest, credit card debt. As we move forward, the argument can be made that raising interest rates on NEW DEBT will result in less overall money being borrowed, and therefore the more profitable the bank's credit card divisions will become. In other words, people will borrow less money overall, but banks will profit more quickly from the higher interest rates. Additionally, a borrower will see more quickly how much they can actually afford to borrow before they can no longer afford the monthly payments. However, those sneaky low monthly minimum credit card payments still entrap many consumers who use credit cards, and that is the way the banks have always wanted it, and is a significant part of the debt problem nowadays. If banks had just charged higher monthly minimums all along, there would be a lot less debt right now. Do you see what is happening? LESS IS MORE! Banks give out less money, but charge higher interest rates, thereby making the God of Cable Media, Wall Street, happy. The problem is the EXISTING CONSUMER CREDIT CARD DEBT that was borrowed when everybody had more wealth and opportunities to pay it off, has gotten railroaded into the new, less money borrowed, higher interest rate charged paradigm. The result is increasing consumer indenturedness from their old time credit card debt, which in turn suffocates the worldwide economy from maintaining as we move forward. Banks were forgiven on their old time debt, can consumers at least have the luxury of paying down their OLD CREDIT CARD DEBTS INTEREST FREE? The ratio of unsecured debt versus home equity has never been worse, and to allow the banks to continue to charge outrageous interest rates on old time credit card debt that they have already made huge profits from is an abomination that will offset any consumer benefit that lower mortgage rates may bring. What makes Wall Street happy, does not necessarily translate into better times for the consumer, and that is something the media refuses to acknowledge, let alone report. The Creepy, Sneaky, Jim Cramer Confession about Stock Market Hedge Fund Price Manipulation from a 2006 interview, found courtesy of MountainSage. This is just creepy to watch. Jim Cramer explains how satisfying it is to artificially spike his own hedge funds to make a quick buck. Yeesh. Click Here for Creepy Crawler Jim Cramer Conversation, courtesy of Mountain Sage. Google News Search Option, just who is "newsworthy" to be listed, and who is the decider? I am trying to figure out how Google knows the difference between a news article, and a newscraping article. In general, many blogs are of the newscraping variety. Newscraping means the blog writer reads an already existing news story, or watches a program on television, and then writes about it. This would be considered "newscraping". The blogger didn't create the news story, instead they re-interpreted an existing story from their own viewpoint. But wait a minute. What if you or I actually do come up with a news story? What if we are the first to report something of note? Will Google News know to include the blog on their Google News search service? I suggest fellow PUMA bloggers do some google research. Write a story about something that you personally witnessed, and then use search words from your article and search Google "news" to see if your story appears. Daily PUMA wrote an article about the KFI Tax Protest and the content was based on what was being said on a radio program. In many respects this is no different than a press conference in which a reporter never gets to ask a question but uses the responses from other reporters questions to write their own story. Even though Daily PUMA reported key facts from the radio show that were NOT reported by anybody else anywhere on the internet, the Daily PUMA article DID NOT appear on Google News Search. Example. KNBC reported that hundreds showed up to the KFI Tax Protest Rally in Fullerton, California. Based on estimates from police officer estimates, it is believed that as many as 15,000 people actually showed up. Daily PUMA was reporting on how inaccurate the television news station was in reporting the attendance, this IS a news story worthy of being on Google News. Most subscribers to google's key word service are actually subscribing to google news, which appears to mean that our blogs may never be worthy of inclusion to the millions of internet users who use google key word search. KNBC News Under Reports Tax Protest Crowd of 15,000 by 95 Percent!!! John and Ken of KFI AM 640 California Anti Tax Increase Rally a Huge Success. 15,000 Southern California Tax Protestors participated in a KFI AM 640 anti tax rally. In a rather strange twist, KNBC reported the grass roots protest crowd as "hundreds" of protestors, under counting the attendees by 95%! The Los Angeles Times refused to cover the rally, and instead ran a story about a protest in Sweden that had half the attendance. Later on, The La Times Internet edition ran a story from another newspaper and added their own snide comments to the article. KABC declined to cover the event. Apparently KTLA, an ally of the Los Angeles Times, may have not covered it as well. I suppose the television and newspaper industries view radio DJ's such as John and Ken of KFI-AM 640 radio no differently than an attorney that advertises their services on television, but I would disagree. John and Ken marshaled 15,000 people to come out on their own time to Fullerton, California. Thousands more gave up because of traffic jams that occurred around the protest site in Fullerton, California. This is a big deal, that is for sure. A side note to all you PUMA blogs. I just googled KFI Tax Protest, Daily PUMA appeared on the first page because this article is only an hour old, but when I then googled "news", Daily PUMA does not show up at all. Is Daily PUMA being obstructed from the news section of google? I'll continue to check and see if this article ever appears on the news portion of google. It's approximately 19 hours later. When I google KFI Tax Protest. under the news option, only 8 hits come up, and Daily PUMA is not one of them. Since the KFI Tax Protest just happened, in theory, there should be almost as many hits for the google "news" option as there is for the standard google search. Something is not right here. Google has figured out a way to not allow blogs to have their articles be considered "news". In case you don't understand what google news is, Google will list story links from the last 20 days. You can change the amount of days you search for, but the KFI Tax Protest is a NEW story, and it is a NEWS STORY, yet google news only revealed 8 News story links to a story that may have been discussed on several hundred blogs. Maybe Google should add a "newscraping" category for all of us lowly bloggers that report about the news. Six Simple Ideas to help people, the economy, and reduce foreclosures. 1. All Renters should be allowed to fully deduct their yearly rent charges on their income tax. The renter's "deduction / savings" would automatically be deposited into a 4% interest bearing account that could be spent on education, medical emergencies / insurance, or used towards a down payment on a home. 2. Instantly reduce ALL primary home mortgages to a Fixed 4% interest rate. 3. Send Full Tax Disclosure statements to all tax payers that calculate and reveal the SUM TOTAL of all the taxes they paid throughout the prior year. 4. Reduce interest rate charges on ALL credit card debt that is older than 1.5 years to zero percent for those that can keep on making their monthly payments. 5. An Additional credit card incentive, pay twice the monthly minimum due and ALL INTEREST RATE CHARGES FOR THAT MONTH ARE WAIVED. 5. Make Tax Refund Checks instantly depositable into special savings accounts that pay 4%, allow citizens the ability to deposit a matching amount as well, don't tax the interest from this account. 6. Make balloon mortgages illegal, instead, have the monthly mortgage slowly inflate, even if it is a month by month increase, have it be such a small amount that the mortgage payer can afford the increases for a few years after the increases have started. Pets In Uniforms, sometimes, nothing more needs to be said. This topic will probably be long remembered more so than any other Daily PUMA article. (Double Click on Image to see a larger version of the Pets in Uniform video, if you dare). Labels: Crazy, Double Click, Pets in Uniforms, Strange, Twisted, YouTube. Latreasa Davis is a Hero, Not a Zero, and should not have been arrested for calling 911 about McDonald's Chicken McNugget Bait and Switch Agenda. 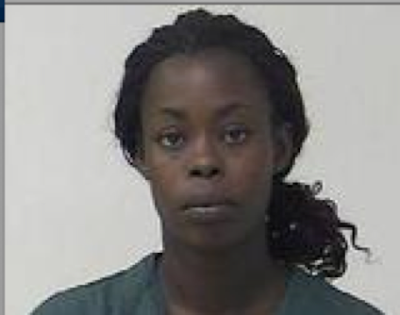 The police arrested Latreasa Davis for "wrongfully" calling 911 when her Chicken McNuggets order was substituted to whatever McDonald's felt like giving her. "You PAID for a garden salad, well, try our super nachos al grande instead, we INSIST". You decide to purchase the purple prius with gold plated hubcaps, "Well we're going to exchange your purchase "request" into a hummer because it is of equal or greater value, and we have a bunch more of them in stock anyways". That's fair, right? The McDonalds in this particular situation offered meal substitutions whenever they did not have what the customer ordered! This is shockingly socialistic. If this particular McDonalds did not have what the customer ordered they would give something else of equal or greater value. The CUSTOMER HAD NO CHOICE NOR WOULD THEY GET THEIR MONEY BACK! While the media tries to get everybody to play along and laugh at Latreasa Davis, Latreasa Davis is a righteous hero in my book. I only wish Latreasa Davis could be recognized as the flash point for THE birth of real consumer rights in this country rather than being ridiculed by our very own stupid media. While everyone mocks Davis's use of 911 for a Chicken McNuggets order gone wrong, the real issue here is that there is no way to instantly report blatant corporate stupidity and have someone from the government actually show up and protect the consumer from the corporation. We should all be concerned that not only is there no way to get instant action over corporate arrogance, if you try to get instant protection, YOU WILL GET ARRESTED and be made fun of by the media. McDonald's should be picketed for actually thinking it is OK to take a customer's money, and then decide what food to give that customer. McDonald's offer of a free make good coupon to Ms. Davis is the final condescending insult from the corporate world to the consumer. 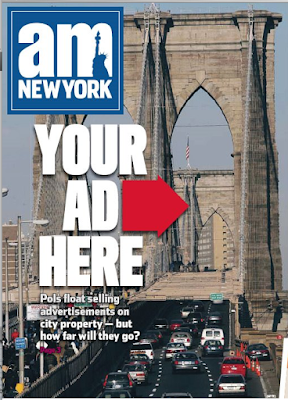 For those of you who don't take this editorial seriously, I DARE YOU to accept someone else's money for a specific product or service that you regularly sell, and then inform the customer you do not have their item and instead will be giving them something of equal or greater value of your choosing, and that under no circumstance will you give them back their money. I double dare you to try that. Actually, please don't, as I don't want to be responsible for your premature demise or likely injury that may result. Would you really accept such shallow treatment if it happened to you? The Bush Administration warned about Freddie Mac and Fannie Mae but were overruled by Congress. This YouTube Video paints the Bush Administration as trying to warn everybody about Fannie Mae and Freddie Mac. What I don't understand is why the Bush Administration didn't have a fall back plan that could have been implemented immediately when the sub prime mortgage rates were spiking overnight. I believe the economic downturn could have been softened if home owners didn't just give up paying their mortgage because it dramatically increased overnight. Regulation does not just have to happen on the front end. Bush, the Republicans and the Democrats seemed more concerned about the banks failing then people who had been paying their mortgage just giving up overnight when the monthly payment ballooned. I still blame the banks for offering a mortgage program that increased the monthly mortgage payment overnight by a factor of 50%, 100%, or even 200% on homeowners. It would have been amazing if just once, we could have seen Bush ride in and actually rescue the average american. Daily PUMA releases its own PUMA STIMULUS PACKAGE and Daily PUMA readers are the beneficiaries! After watching Congress effortlessly add money to the United States economy, Daily PUMA wondered if extra width could be added to the two, far right PUMA Blog columns. After playing with column width numbers, Daily PUMA is pleased to announce its very own PUMA STIMULUS PACKAGE! If you look to the right you will notice BOTH PUMA COLUMNS ARE NOW WIDER! DailyPUMA hasn't quite mastered the art of creating column width out of non-existent space with the same ease that congress creates wealth out of thin air. It appears that when the right two PUMA columns were widened, the center, main column shrank by an equal amount. In an effort to appease all points of view, the left column of the blog, the non PUMA blog column, was also widened just a tad, resulting in even more shrinkage (aka tax cut) of the center column. For some reason, DailyPUMA can't seem to master the concept of increasing all the columns that demand increases while also maintaining the original size of the center column. Good News, Bad News about DailyPUMA. Well, it's mostly good news actually. Daily PUMA has EXPANDED the two right columns of this blog to give better highlighting to the PUMA blogs. The Wider columns should also increase how long each PUMA article remains near the top of the column. (It's a mathematical, longitudinal distance thing). The bad news is the center column had to be shrunk and now has to have all the individual video clips readjusted. At the moment the time to do that cannot be found. Reflecting on Team Sports and how they prepare us for our adult social interactions. I have this nagging suspicion that being part of a team sport, and then being able to walk away from the game afterwards without either being indifferent to the experience, nor so passionate that one remains emotional about the outcome for far too long, can lead one to developing healthy relationships later on in life. If a team sport has creaed an environment in which the players work with their teammates for the best result while caring about the outcome, yet once the game is over are able to move on, that person is setting themselves up for a lifetime worth of terrific social interactions. It is quite the irony to think that something as nebulous as playing a team sport may actually have a huge impact later on in life when it comes to dealing with others in a variety of social situations, but I think there is a correlation.